I have been baking and freezing like crazy for the upcoming shower that I am co-hosting for my future daughter-in-law July 23rd. I don't want to give too much away, but instead of one big cake, we are having mini desserts and of course, cupcakes. One of the cupcakes requested by the Bride-to -be is Key Lime Cupcake, which will be posted later. After I made the Mini Key Lime Cupcakes, I had some of the Key Lime Mixture left over. What to do with it? I certainly couldn't waste it, but I didn't have enough to make the Key Lime Pie, so I made Mini Key Lime Tarts with the graham cracker crust on the top, just perfect for my little ramekins. Now if you are are thinking, that the custard isn't green, well key limes are green on the outside, but not on the inside, and the juice isn't green. So if you have a piece of Key Lime pie and it's light green, food coloring has been added to it.
" Graham The recipe is easy peasy, I love that new term, especially for summer:), if you have the right ingredients. The main ingredient that you need is this, Nellie and Joe's Famous Key West Lime juice, available in may grocery stores, and specialty shops. The recipe is on the bottle. 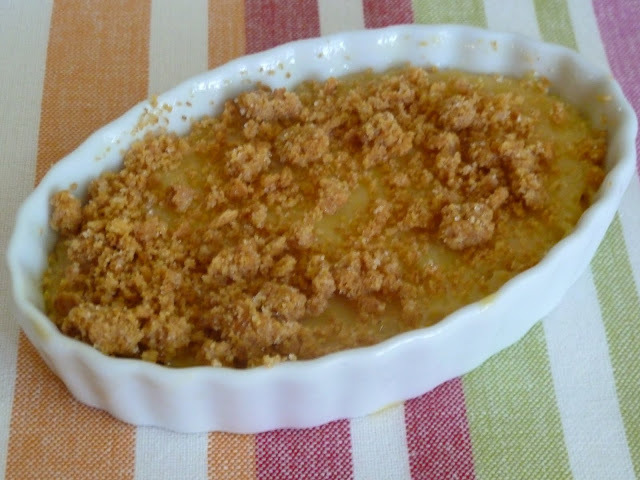 Besides the Key Lime Juice, all you need is 1can of sweetened condensed milk, 3 yolks, and a graham cracker crust, either pre-made or made from scratch. When I made my tarts, I baked them first in the ramekins, and just made a small amount of graham cracker crust in a small pie pan, ans crumbled it on top of my cooled tarts.so easy and delicious. There is also a dessert dip that you can make to be posted later. Combine,milk, egg yolks, and lime juice.Blend until smooth. Pour filling into a pie shell or ramekins that have been sprayed. Bake for 15 minutes. Remove from oven, and cool on rack 10 min. before refrigerating. Just before serving you can garnish pie with whipped cream and lime slices, or if you are making the upside down version, top with crumbled graham cracker crust. Enjoy! What is summer without Key Lime Pie! 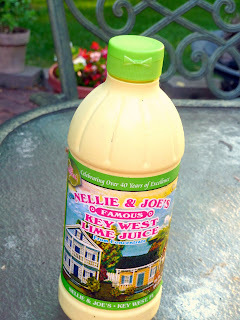 I have not received any consideration or product the Nellie & Joe's Key West Lime juice, I just like the product, and have used it for many years. 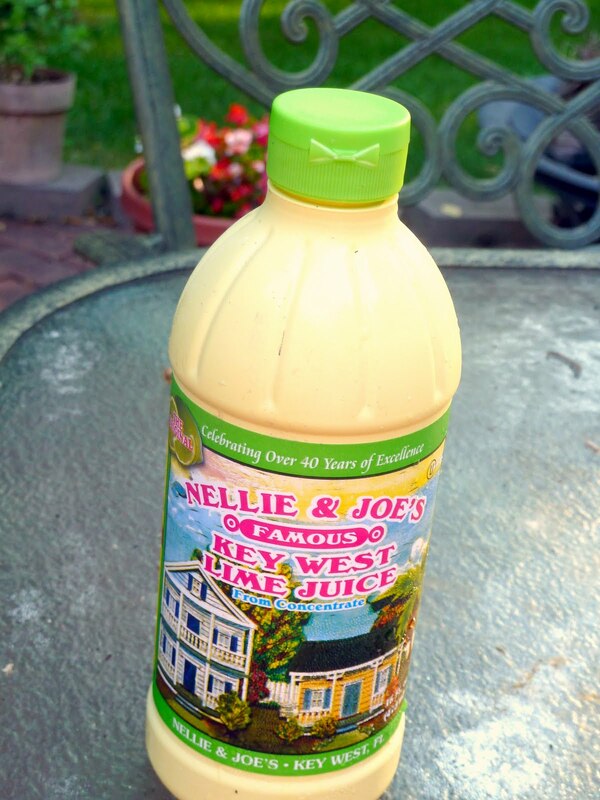 yes, Nellie and Joes is the next best thing to squeezing your own juice. Kudos to all your effort towards the bridal shower. Individual desserts are the way to go, but they do take a lot of time. Great use for extra filling-thanks for sharing the recipe for these little tarts! What a fantastic little recipe. I love the crumb topping and the ease of making something that taste so fantastic. I use Nellie and Joe's too since finding key limes is next to impossible around here. Christiane-Yes, Nellie and Joe's is a great little product.You can also make a dessert dip from Nellie and Joe's, to be posted soon. Great recipe! Love the crumb topping. Christine-Thank you for your comments. I do love key lime pie! So sorry I wasn't able to meet up with you in Chicago last week. Things were so hectic, and it was hard to coordinate with my brother-in-law with us. We'll be back to visit family again, so maybe next time I can carve out a morning to myself!! Becky-That's the best key lime juice that is authentic that you can purchase. I always keep at least two bottles of this key lime juice around. I'ts authentice from Key West! Love your mini key lime tart with the crumbs topping...so yummy, and pretty! Wendy- I wondered what happened, but then I though that there may be time constraints involved. Maybe next time. Looks like you hit all "hot places." Elisabeth-Yes, that juice is the best, and we can get it even in Chicago.Glad that you liked the mini Key Lime Tart. Oh, Becky! These look just fantastic!! I love lime anything and I'm partial to the mini desserts. i wish you were my MIL!!! Delicious! My mom loves key lime anything so I want to make these for her soon. Thank you for sharing this recipe with me. I hope you are having a blessed week, Becky. Much love! Your lime desserts are just adorable. What a great way to use the rest of your lime! Kim-I love lime! I wish that you were my daughter. I don't have one. Beth- I like the mini desserts, too. These look adorable and delicious.